"I know a guy…" Amazon Studios & STX Entertainment have revealed the first red band trailer for the dark comedy Gringo, the latest film directed by Nash Edgerton, brother of Joel Edgerton (who also appears in this). Nash has worked as an actor, stuntman, writer, and filmmaker previously, making some outstanding short films over the years (look for Fuel, Lucky, Spider, Bear, The Captain). Gringo is about an obedient businessman who takes a trip into Mexico for his drug company, but everything goes crazy once he's there. David Oyelowo stars, with a cast including Charlize Theron, Joel Edgerton, Amanda Seyfried, Yul Vazquez, Thandie Newton, and Sharlto Copley. This looks totally kooky and entertaining in the most absurd ways, which is exactly what I want from a good dark comedy. I'm actually looking forward to it now. An exhilarating mix of dark comedy, white-knuckle action and dramatic intrigue, Gringo joyrides into Mexico, where mild-mannered businessman Harold Soyinka (David Oyelowo) finds himself at the mercy of his back-stabbing business colleagues back home, local drug lords and a morally conflicted black-ops mercenary. Crossing the line from law-abiding citizen to wanted criminal, Harold battles to survive his increasingly dangerous situation in ways that ask: Is he out of his depth - or two steps ahead? 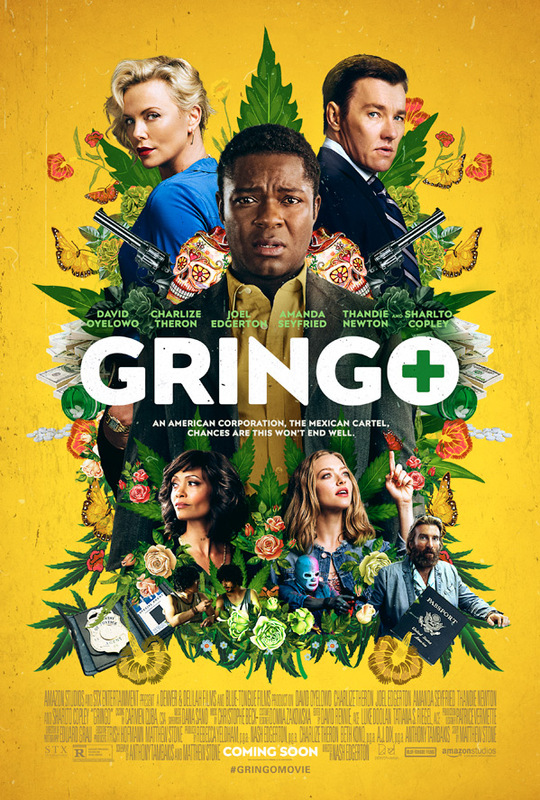 Gringo is directed by Australian filmmaker Nash Edgerton, of the film The Square and a number of excellent shorts. The screenplay is written by Anthony Tambakis and Matthew Stone. Amazon Studios & STX Entertainment release Edgerton's Gringo in select theaters starting March 9th, 2018 next year. Who's excited to see this?